Pictured, Rafael Reyna who was attacked post game at Dodgers Stadium. 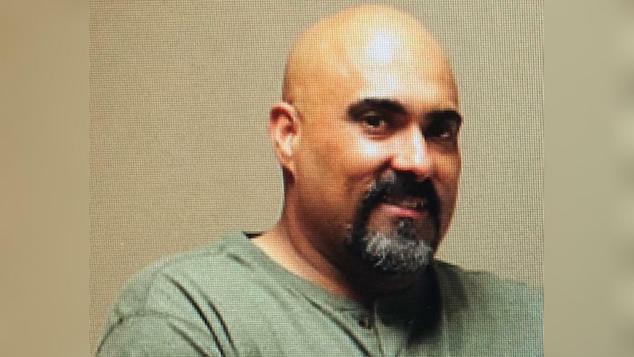 Rafael Reyna: A father of four is on life support after being attacked post game at Dodgers Stadium in the parking lot. No arrests made. A California father of four is on life support after an altercation which escalated following post game, Friday night at Dodger Stadium. Rafael Reyna suffered severe head injuries, including a fractured skull following the game at a parking lot just after midnight. To date, Los Angeles police have yet to locate the suspect. Speaking to KABC – Reyna’s wife, Christel said she was on the phone with her husband, who had gotten into an argument with someone, only for the woman to hear the sound a crack and her husband then moaning. ‘I was hearing the arguing happening and then I heard like a smack, a crack. … It sounded like a baseball bat, and then I heard him start moaning,’ the wife told the media outlet. Witnesses told security that another fan had struck him. Police reportedly are looking for a man in his 20s who fled in a white SUV. Christel said her husband also struck his head on concrete during the attack. The Dodgers addressed the incident in a statement on Saturday. Rafael’s family set up a GoFundMe account to help cover his medical expenses. Christel and Rafael have one adult son and three young children, ages 11, 12, and 13. ‘He was the main source of income for our family and somehow someway we need to make it through this,’ Christel said. As of Sunday afternoon, no arrests have been made.